Published: Mar 2, 2017 to ? Started reading this one a whim the other day since it doesn't have many chapters so far. Demons and stuff aren't typically my thing, so I didn't expect for it to really catch a hold of me, but I was very pleasantly surprised. The artwork seems a little sloppy an clunky at times, aside form more detailed panels, but it's not really a problem since in a way that just adds to its charm. The characters are super creative, fun and easy to like, even the ones that are supposed to be the "bad guys." The humor is well-timed and genuinely funny. There's no lack of touching moments, despite there being only 12 chapters at the time I wrote this review. On top of all that, the hints of an underlying plot keep you wanting more. I'm very excited to see where this is going. I definitely recommend this one if you're looking for something fun and lighthearted. The story depicts the original and unique plot . A human boy who was unlucky sold to a old Demon Sullivan. It is very fun to read and interesting to repeat again. Every chapters day by day gives a hype and excitement that probably one of the good traits of this manga. Even though, the characters potrayed are very not good at all yet the author shows a lot of funny reactions and jokes that slightly find in other mangas. Nothing can be done, a first human who settled in the Demon World. The first human who gets a first servant who is the number 1 in the rankings of freshmen. The first human who gets a familiar. And the first human maybe a candidate for Demon Lord's Throne. Everything in the story are hilarious and very much appropriate for kids, adults and also for anyone. I like this Manga, a lot. 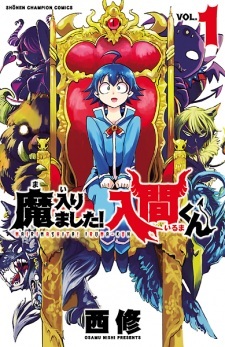 This is a comedy manga, and I'll tell you, it's really funny. I want you to read this manga on your own, so I won't tell you anything about the story, but it begins with a comedic misfortune for the MC followed by even more comedic misfortunes, all of which were mostly out of the MC's control. The art could use some work, but since this is far from a professional project, I definitely think it's good enough. I love the characters. Not just the main character, I love all of them. The supporting cast are a comedy-gold cast of misfits that actually serve a purpose in the plot and have a personalities that aren't centered around the MC. Super well-written if you ask me. I'm enjoying the... HELL out of this series so far. Can't wait for more of it to be subbed. Keep up the good work, Nishi Osamu!